AUSTIN, TX.– Join Washington QB and Former Texas All-American Colt McCoy at the Baylor Scott & White Health Colt McCoy Football ProCamp. The ProCamp takes place on Monday and Tuesday June 29th-June 30th, at West Ridge Middle School, 9201 Scenic Bluff Dr., Austin, TX,. for Boys & Girls, Grades 1 to 8. Source: Procamps. Throughout the camp Colt McCoy will offer tips and instruction, highlighting the finer points of football. Participants will experience various stations specializing in fundamental football skills and will participate in touch football games and will be placed in small groups according to age to ensure that each child gets maximum instruction. Colt McCoy is currently the NFL quarterback for the Washington Redskins. He played college football at the University of Texas in Austin. He was drafted by the Cleveland Browns in the third round of the 2010 NFL Draft out of the U. of Texas. McCoy is also a popular Christian speaker and keynote speaker. Sports Speakers 360 is a booking agent for pro athletes. 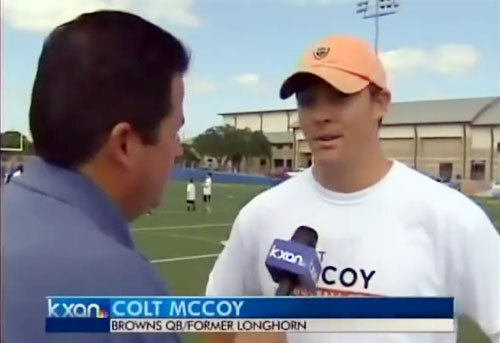 If you would like to book Colt McCoy for a speaking engagement, appearance or endorsement, contact Colt McCoy’s booking agent for fees at 1.855.303.5450.